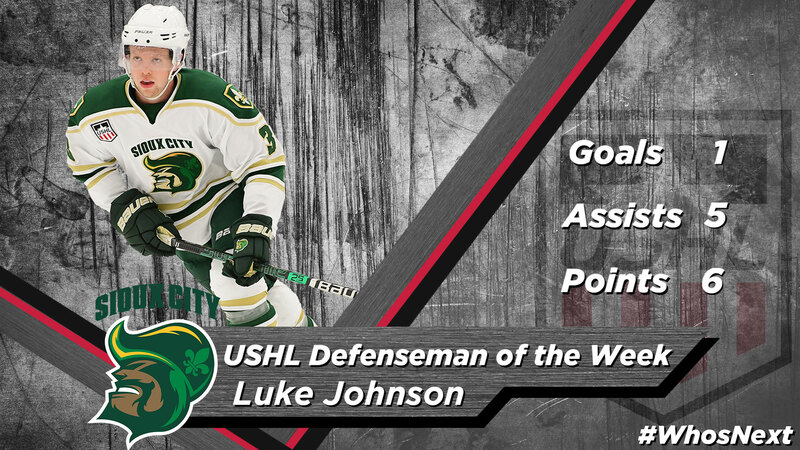 Pair of NHL Draft prospects, Sioux City defenseman Luke Johnson earn weekly honors. The United States Hockey League announced the Forward, Defenseman and Goaltender of the Week for Week 5 of the 2018-19 season. 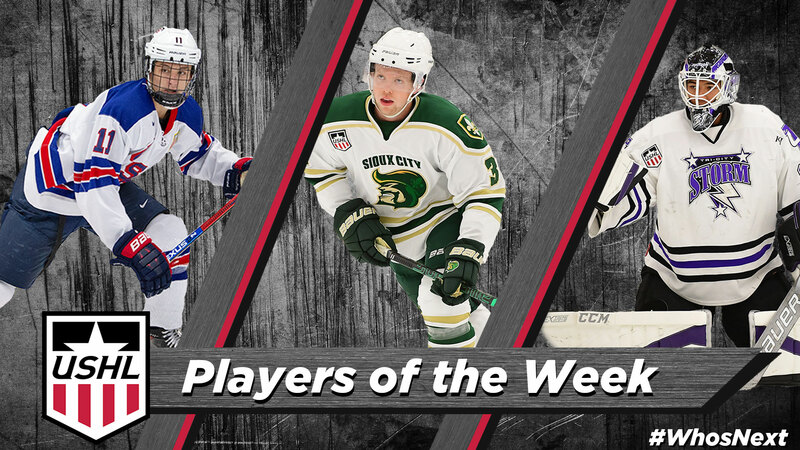 Team USA forward Trevor Zegras and Sioux City Musketeers defenseman Luke Johnson earned their first career weekly honors, while Isaiah Saville of the Tri-City Storm was named Goaltender of the Week for the second time in three weeks. Zegras scored twice and added five assists in Team USA's (U18) pair of 8-3 victories over the weekend, Johnson scored a goal on Friday and dished out four assists on Saturday, and Saville made 25 saves on 26 shots to lead Tri-City to a shootout win in his only start of the weekend. The USHL is America’s only Tier 1 junior hockey league, and continues to lead the world in the advancement of players to Division I college hockey. Zegras scored his first goal of the season and added three assists in Team USA's 8-3 victory on Saturday in Muskegon before picking up his second goal in as many nights and dishing out two more helpers to help the U18s to another 8-3 victory on Sunday, this time at home against Dubuque. In three games this season, the Boston University commit has tallied seven points (2G, 5A), second among all Team USA U18s players to Cole Caufield, while his 2.33 points-per-game leads all USHL players. A native of Bedford, NY, Zegras is in his second USHL season after making a name for himself during the 2017-18 campaign. He recorded 32 points (11G, 21A) in 31 games to help Team USA earn the top spot in the Eastern Conference standings. He also tallied six points (1G, 5A) in eight Clark Cup Playoffs games, helping Team USA reach the Eastern Conference Final. Zegras is regarded as one of the top prospects for the 2019 NHL Draft and was listed as an A-rated skater on the NHL Central Scouting Preliminary Players to Watch list earlier this month. Before joining Team USA, Zegras skated for Avon Old Farms (USHS). Johnson recorded at least one point in all of his games last week. He dished out his first assist of the week in Sioux City's 3-0 shutout of Des Moines on Tuesday. He followed that up by scoring his second goal of the season on Friday against Sioux Falls and helped Sioux City snap the Stampede's five-game winning streak on Saturday with a four-assist performance. With the six-point performance last week, the Providence College commit has now recorded 11 points (2G, 9A) on the season, the most among all USHL defenseman, tied for ninth among all USHL players and third on the Musketeers behind only Martin Pospisil and Bobby Brink, who are first and tied for third in USHL scoring, respectively. Through 10 games, Johnson has already eclipsed his goal and point total from last season, as he tallied one goal and eight points in 56 games during his 2017-18 season, his first in the USHL. The Edina, MN native was selected by Sioux City in the ninth round, 147th overall in the 2017 USHL Phase II Draft and previously played for Edina High in Minnesota. 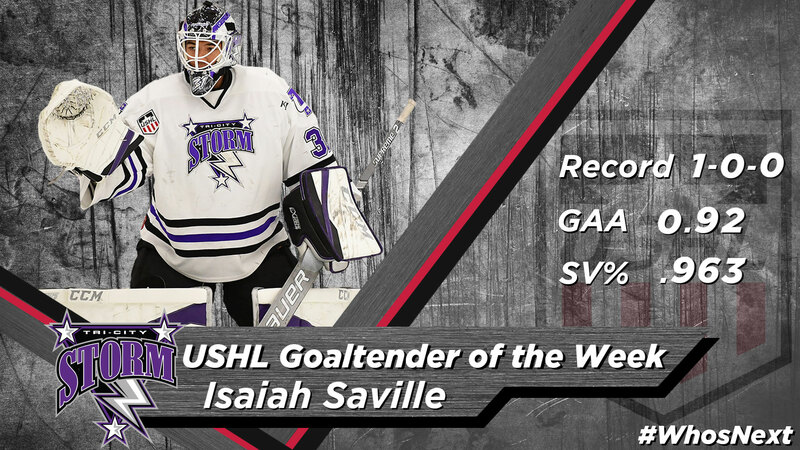 Saville earned his second Goaltender of the Week award of the season with his performance on Saturday, where he stopped 25 of the 26 shots he faced to lead the Tri-City Storm to their second shootout victory over the weekend, a 2-1 road triumph over the in-state rival Lincoln Stars. With the win, the University of Nebraska Omaha commit moved his record on the season to 5-1-1-0 to go along with a dazzling 1.54 GAA and .941 SV%, helping the Storm allow just 19 goals through 10 games, making the only team in the USHL to have allowed fewer than 20 goals against through five weeks of the season. Saville has also been the best goaltender in the USHL through those five weeks, as his 1.54 GAA and .941 SV% are both the best in the league. The Anchorage, AK native previously won USHL Goaltender of the Week on Oct. 15, was named to the NHL Central Scouting Preliminary Players to Watch List earlier this month, and participated in last month's USA Hockey All-American Prospects Game. Saville spent the 2017-18 season with the NAHL's Minnesota Magicians, where he posted a 2.41 GAA and .927 SV% en route to being named to the All-NAHL Second Team. Before his time in junior hockey, Saville played for the Colorado Thunderbirds (T1EHL). He was acquired by Tri-City from the Madison Capitols via trade before the 2018 USHL Phase I Draft.